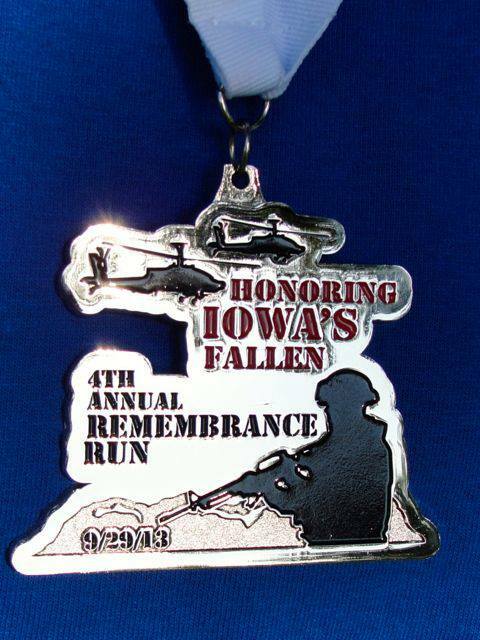 Red Bull Rising: Iowa Remembrance Run: 30 Days Left to Register! 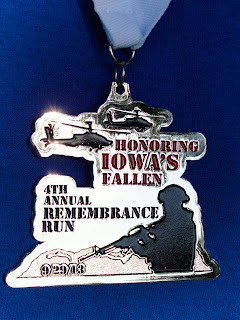 The Fourth Annual Remembrance Run will be held 10 a.m. Sun., Sept. 29, 2013 at Raccoon River Park, West Des Moines, Iowa. More than 800 registered runners participated in the 2012 event. Iowa Remembers maintains a list of honored dead. Prior to each year's race, that list is read aloud, along with either a performance of the U.S. National Anthem and/or recitation of the Pledge of Allegiance. Earlier this year, the group also funded a newly painted "Polk County Freedom Rock," which was installed at an American Legion post in Bondurant, Iowa. Registration for the Fourth Annual 5K walk/run event is $25 through Sept. 15. Late registration is $30 between Sept. 15-22 (with no T-shirt guaranteed). Both team and individual registrations are available. Children 12 and under can participate for free, but registration is required to receive T-shirt and medal. Iowa Remembers maintains a Facebook page here.